The United States has witnessed a massive increase in childhood obesity in recent decades, and obese children often grow up to be overweight or obese adults. If rates continue to rise along the same historical trajectory, 50 percent of American adults will likely be obese by 2030, says the nonprofit organization F as in Fat. 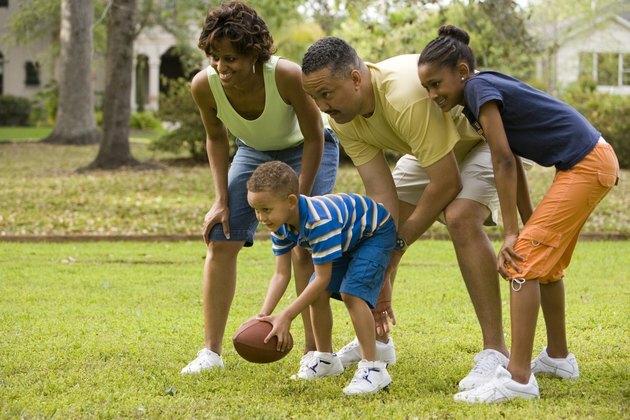 Encouraging children ages 10 to 14 to engage in physical activity for at least an hour daily can help them reach and maintain a healthy weight. Encourage school-aged children to exercise for at least an hour every day, and consider exercising with them. According to the KidsHealth website, it’s not necessary for physical activity to occur all in one session; if need be, exercise can be broken up into several 15-minute chunks. Make it fun by selecting seasonal or adventurous activities for the whole family to enjoy together, such as ice skating in winter or taking an indoor rock-climbing lesson. In addition to helping kids maintain a healthy weight, reaching the hour benchmark of exercise time every day has notable mental benefits. According to MedlinePlus, children who make the quota are more self-confident, feel less stressed, have healthier bodies, sleep better and learn better. A 2007 study conducted by researchers at the Medical College of Georgia reported that kids who got at least 40 minutes of exercise per day scored better in cognitive tests than kids who got 20 minutes or less of daily physical activity. According to the Get Kids in Action website, children's daily physical activity levels begin to drop at about age 13 for girls and age 15 for boys. Encouraging children to enjoy daily exercise from an earlier age may help curtail this tendency. Consider signing kids up for team sports or other structured forms of exercise while they’re still in elementary school or middle school. Establishing exercise as a daily habit early on can help form a lifelong healthy connection to physical activity. If your child is already obese, a pediatrician may recommend exceeding the hour-long daily guideline. Even for healthy children ages 10 to 14, the daily 60-minute guideline for kids’ physical activity is a minimum for health maintenance and proper development. Keep in mind that not all exercise has to be structured or even vigorous. A kid who isn’t into sports, for example, might be moved into action by playing an active video game or arcade game with friends. Pay attention to anything your kids like to do that gets them moving, and actively encourage those habits whenever possible.